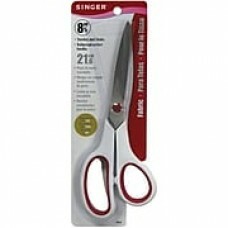 The 8.5" Singer Bent Fabric Scissors are durable and can be used to cut a variety of fabrics and dress materials. If you like taking on DIY projects, the Singer Sewing Scissors will certainly come in handy. Made of stainless steel, these scissors are durable and long-lasting. Featuring a pointed tip, these scissors will help you achieve a more efficient output. With a rubber make, the handles can withstand the rigors of regular use.